Centuries as a crossroads between Europe and Asia has helped Turkey grow into a vibrant country that is chock full of ancient history and is home to one of the globe’s most intriguing cultures. If that wasn’t enough, you can experience one of the world’s great cities, a stunning landscape, friendly people, and so much more! We’ll cover when and where to go in Turkey, how to get around, how much you can expect to spend, and how to stay safe. April to October is the most pleasant and common time to visit Turkey, though you can expect an abundance of crowds if you travel in the middle of summer. Winter weather varies between rain and colder, snowier temperatures (especially in parts of Anatolia) but there are also far less crowds. You have a variety of options when it comes to getting around, namely driving yourself, busses, planes, or trains. Renting a car is the most convenient option to see the rural and wild side of Turkey – though some remote roads aren’t good for night driving. Unlike many countries, buses are generally the slightly more expensive but faster (and better) option when compared to trains. 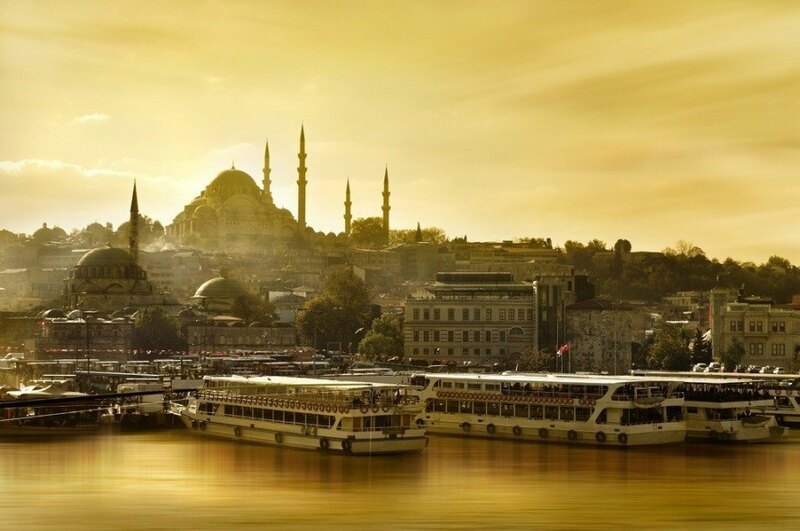 It’s not just the crown jewel of Turkey; it’s one of the greatest cities in the world. The massive metropolis of Istanbul may have changed its name many times over its long history, but it has always been at the centre of civilizations both European and Asian. Today, Istanbul is a mega city that proudly boasts amazing cuisine, a cityscape that is both traditional and modern, and some of the friendliest and most talkative people you’re likely to find. Whether you’re spending a day at one of the city’s many cafés enjoying a Turkish coffee, haggling at the world famous markets, or just taking in the sights (including the magnificent Hagia Sophia), there’s no end to the superlatives that can truly encapsulate what Istanbul is. Just know that you have to visit. While often overlooked in favour of the larger Istanbul, Turkey’s capital more than holds its own as a viable holiday destination. The history that is clearly visible in the former isn’t on offer here, but instead there is a distinctly modern aura about Ankara. Students and businessmen alike have turned the city into a thriving cosmopolitan hub of activity – one where you can sample some of the country’s best food. It’s not the most touristy city, but is instead a reflection of a different side of Turkey – one that showcases the country’s recent successes well. We can’t forget that some of Anatolia’s best sights (including Gordion and Beypazarı) are nearby. Few cities showcase the intermingling of ancient and modern in Turkey better than the Mediterranean Side. Being on the Mediterranean, the city is home to ample resorts set alongside gorgeous white sand beaches. While this is often reason enough to consider a visit, you’ll also find some of the best ruins from Greek and Roman times within and around the city’s borders. A massive amphitheater dominates the cityscape while the ruins of the Temple of Apollo are found on the same peninsula. All told, Side will appeal to both history buffs and those looking to simply relax in the warm waters of the sea. What sets this Mediterranean city apart from similar locales is clearly evident upon first visit – the setting. While the long beach and beautiful Turkish Riviera location are inviting, the imposing mountains and cliffs that make up the backdrop of Antalya are something else entirely. The city itself offers both the old and new (as is the case with many Turkish cities), ensuring that visitors can get the full experience by travelling here. 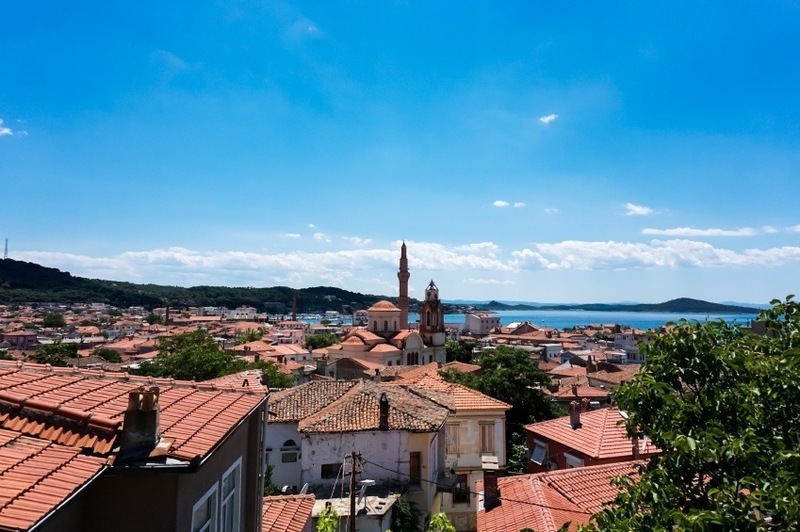 Another seaside location, Ayvalık nonetheless offers something a bit different from the tourist-friendly resorts. 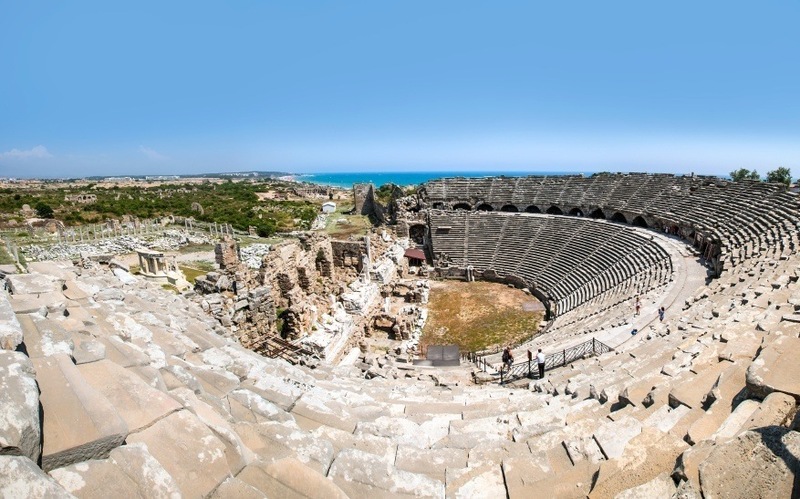 It’s truly a working city, and largely bereft of the throngs of visitors that populate the beaches of Side and Antalya. 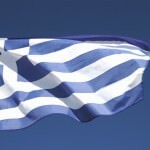 Centuries of Greek civilization have made their mark on the city, giving it a different vibe than most others. The small, cobblestone streets are ideal for walking (or taking a carriage) while the welcoming cafes offer great food and drink without losing sight of their authenticity. You’ll also find many buildings and businesses associated with the olive oil industry, which has called Ayvalık home for many years. 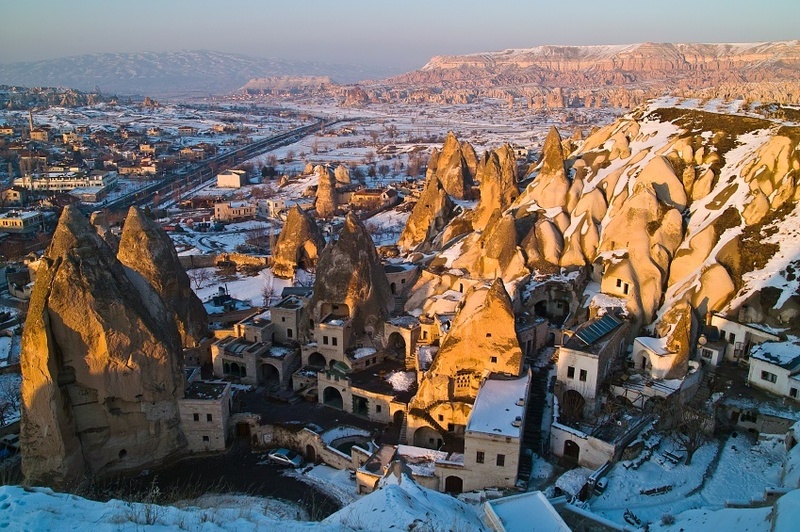 Probably the most unique destination on our list is the Anatolian region of Cappadocia. Known for unusual and distinctive rock formations that lend the entire place an otherworldly air, there’s actually even more to discover than that. In the past, underground homes were carved into the rocks, turning the caves and tunnels into a refuge and town of sorts. Today, you can still visit some of these establishments and even stay in the hotels if you so desire. Cappadocia isn’t really a place you can believe exists in our world until you see it for yourself – so we’ll just move on and let you go do that. From Africa all the way to Northern England, the Romans built and maintained great cities and structures that have remained in some form to this day. One of the most impressive is Ephesus – originally a Greek settlement that grew into a major city of the Empire during its day. While Italian sites like the Forum in Rome and Ostia Antica are hugely impressive, Ephesus arguably one-ups them when it comes to a preserved picture of a Roman city. 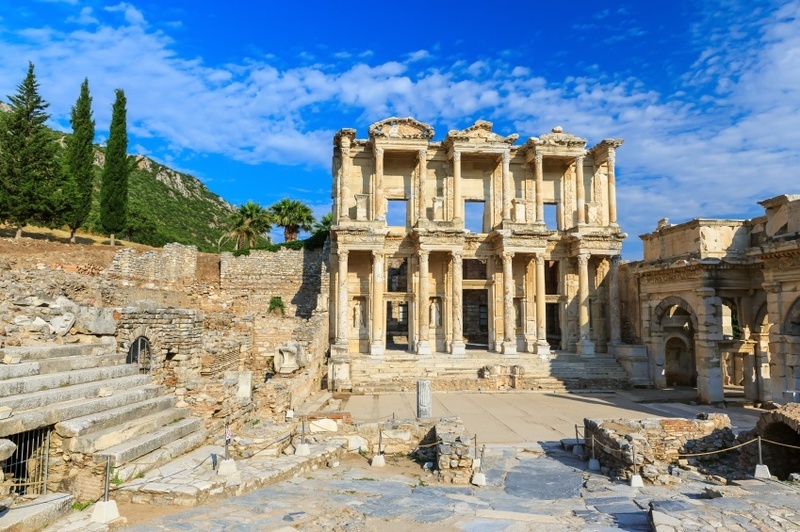 For any Roman history buff, Ephesus is a must – but it’s sure to capture the imagination of even the casual tourist. A unique natural phenomena found in Western Anatolia is the hot springs of Pamukkale (or ‘Cotton Castle’). Once a spa city for two ancient empires, the tiered hot springs of mineral rich water are a truly bizarre and wonderful sight. While there are restrictions in place to protect it, bathing is still permitted in certain areas (avoid crowds by going later at night). It’s a unique experience you’re likely not to find elsewhere in the country. Round trip flights between Pearson and Istanbul are surprisingly cheap when compared to similar destinations. Prices start around the $750 Canadian mark though, as always, you can find cheaper deals on offer if you look. Be sure to shop around, change your airline (there are both direct and connecting flights available), and adjust your arrival and departure dates to get the best rate possible. 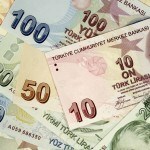 Prices in Turkey are generally cheaper than nearby Eurozone countries. On average, you can expect to spend about $68 a day with a budget of $41 for accommodation and $15 for food. Those with a talent for conserving funds could even get by with about $25 a day while living like the sultans of old will run you closer to $196 a day. 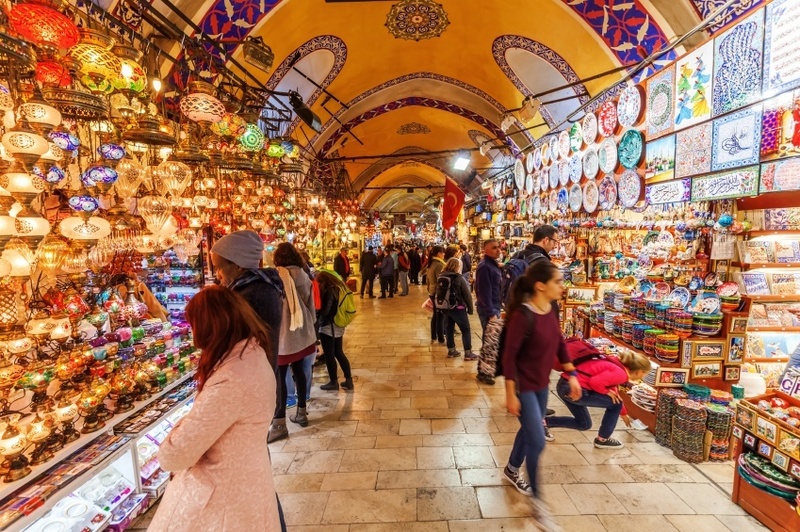 Prices will fluctuate, especially in major tourist areas such as Istanbul – so be sure to have some extra funds on hand for the sake of spontaneity. There is no nationwide advisory for Turkey according to the Canadian government, however a high degree of caution is recommended throughout due to the prevalent threat of demonstrations and terrorist attacks. More importantly however, travel is not recommended for any reason to within 10 km of the Syrian border. In addition, non-essential travel is not recommended to numerous provinces that border Syria and Iraq including Hakkari, Siirt, Sirnak, Mardin, Sanliurfa, Gaziantep, Kilis, Tunceli, Batman, Mus, Diyarbakir, and Hatay. This is all due to the current security situation in these regions, which includes terrorist attacks, kidnappings, and other violence. The southeastern part of the country (near the Iraqi border) is a common point of conflict between the Turkish government and ethnic Kurds. Tough security measures have been imposed in many areas, and overall it’s better to avoid the region altogether. Terrorist attacks have been known to happen across the country. Be aware of your surroundings at all times and follow the advice of local authorities if a situation should arise. Demonstrations can also take place throughout Turkey, sometimes turning violent. Avoid these no matter the situation. Petty crime is a danger (as it is in most countries) while assaults have also been known to happen. Avoid flaunting wealth and be sure not to leave belongings, food, or drink unattended. For more information on how to stay safe in Turkey (something millions do every year), check out the Canadian government’s travel advisory website HERE. Planning a trip to Turkey now? Get your currency right away! These are just a few examples of where to go in Turkey, there’s tons more to see and do. If you think somewhere else should be on the list, let us know in the comments. 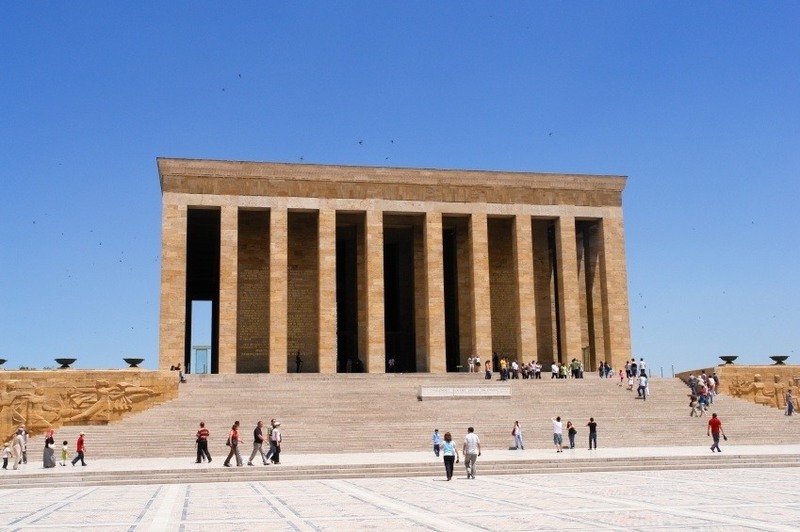 Check out our Country of the Week for more general information about Turkish history and culture.